Trying to decide between the need for energy, and the desire to get all the benefits of a 100% Juice? Well you no longer have to make that painful sacrifice. Introducing NEW AMP ENERGY Juice. AMP ENERGY Juice contains all the awesome potency of AMP ENERGY in a 100% juice formula, a totally different taste that'll bring you the same world-beating results (whether or not you taunt the world after beating it is up to you). The debut flavors, Orange and Mixed Berry, both come in a 100% juice formula that packs all the taurine, ginseng, and guarana of their Energy forebears, while also providing an excellent source of B and C vitamins -- a far better way to start your day than that frosted square that just popped out of your toaster. Both formulas come in a 12oz resealable bottle and, unlike the nicknames of 93% of all lightweight boxers, there's no added 'sugar'. 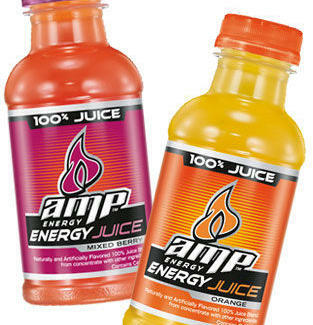 Hit up ampenergy.com for more info on AMP ENERGY Juice, plus bonus features like a behind-the-scenes look at Dale Jr. getting ready for race day -- if you're trying to decide between watching that and doing work, well, there really is no decision.